What a title, right? When I say Googl’s AdWords free coupon is not free, I don’t mean like you’ll probably spend some of your money afterwards (which is also probably true) kind of not free. I mean literally, if Google gives you $100 free coupon, Google will earn $100. There is no trick, no small hidden text, it’s all out there, perfectly clear. The thing is, it’s not the person who is receiving the coupon that’s going to pay Google $100, it’s other already existing advertisers that are going to do so. Google AdWords is bid based system. Once you inject more money into it (free coupon), you are automatically raising the keyword bids needed to advertise. So when Google hands out a $100 coupon to a new advertiser, this advertiser’s competitors who are already Google’s most valuable paying customers are going to loose $100. Unbelievable, right? Google didn’t just attract a new customer for free, Google actually earned money by hurting its longterm customers. Do no evil… right. Now that you know this fact, you’re probably not really happy about Google’s new campaign in which they will give $100 coupons to first 1 000 000 small businesses that sign-up for local search advertising. Yes, you got the numbers right, Google will take 100 million from our pockets for this campaign. I used one of these “free” coupons for a test. I paused the campaign after a few days before the credit was over. Then I had an automatic payment of $18.96 taken from the credit card that you have to enter to use the coupon. I tried to contact the support. I got a refund of $0.66. 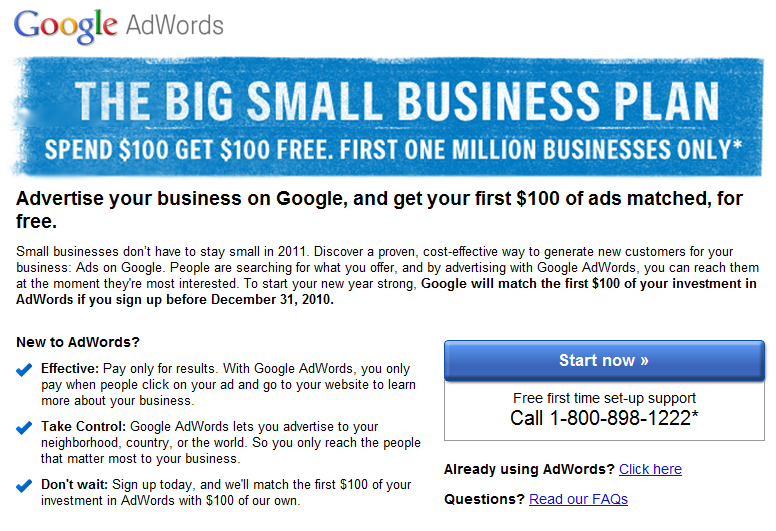 Google AdWords free coupon is really not free. And I mean you’ll spend some of your money afterwards. Sorry…. Offer valid only for sign ups by customers with billing address in the US or Canada.